ROCKINGHAM MECHANICAL SERVICES. Motor Vehicle Repairs Rockingham. 1)	COMPLIMENTARY WASH, VACUUM AND SMELLY TREE WITH EVERY SERVICE! 2)	Lifetime workmanship warranty, for total peace of mind! 3)	Only use service parts that meet manufacturer specifications, hence will not void your warranty! 4)	Fully government licensed workshops with licensed technicians 5)	Free local pick up and drop off for your convenience 6) All work only undertaken upon approval: “Autobahn’s price never exceeds the Quote!” 7) Each location individually owned and operated, so you’re dealing with the owner who actually appreciates your business 8)	Friendly and honest service, no hidden costs! 9)	Environmentally Conscious Service Centres, environmentally friendly disposal of all waste! 10) Modern and Clean workshops with the latest diagnostic and service equipment! Autobahn recognises the need for today’s motorists to have a dependable, expert approach to vehicle maintenance and repair. Autobahn uses only fully qualified mechanics and auto electricians to ensure we get it right first time, and on time. We cannot survive without our clients’ goodwill and will always work to ensure your future business. 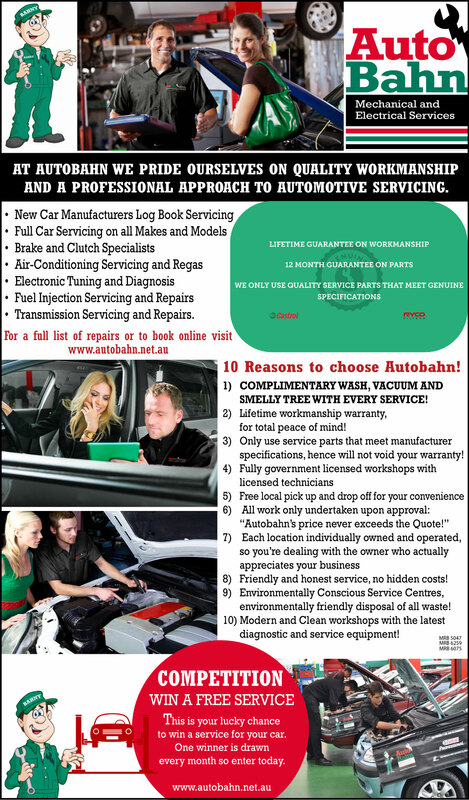 Autobahn fully guarantees all workmanship and all replacement parts. If you are not fully satisfied we will undertake to remedy the situation free of additional cost. We appreciate and welcome clients’ comments as they are the best way we can further improve our service. Authorised to perform manufactures log book services….Compare a price today!